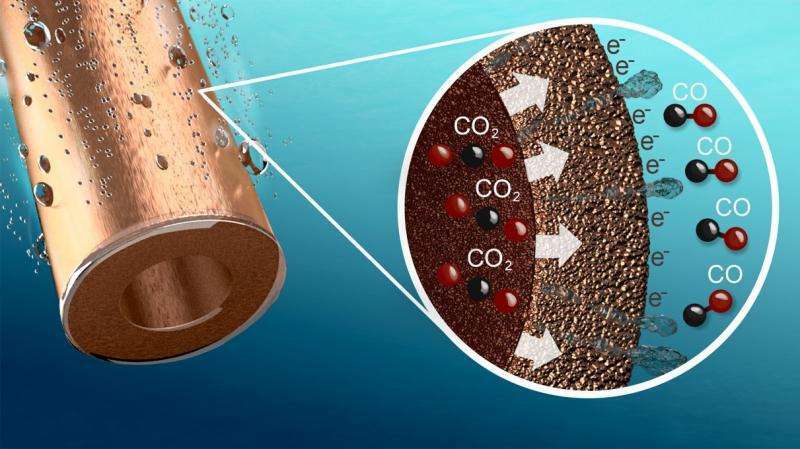 Scientists at the University of Twente research institute MESA+ have developed an electrode in the form of a hollow porous copper fibre which is able to convert carbon dioxide (CO2) into carbon monoxide (CO) extremely efficiently. In principle the invention enables a wide variety of industrial processes, for example in the steel industry, to be made more sustainable. The researchers have applied for a patent on their invention, and their research results have been published in the scientific journal Nature Communications. Researchers at the University of Twente have developed a hollow copper fibre which can be used to convert CO2 into CO with a very high efficiency. The fibre, which serves as an electrode, is provided with countless minute pores. If the fibre is placed in a bath of water, a voltage potential applied, and CO2 pumped in, the CO2 is converted into CO as it passes out through these pores. The principle is straightforward but the efficiency and selectivity of the reaction are surprisingly high, in part because the electrode provides a huge surface area on which the reaction can take place. An important innovation is the optimized interface between gas, fluid and copper particles, allowing the very efficient supply of CO2 and removal of the product, CO. Conversion takes place at about ten times the rate when using the most advanced copper electrodes currently available, while the selectivity (expressed as the percentage of electrons that actually convert CO2 into CO) is 85%, compared to 35% in current copper electrodes. The newly developed electrode also performs better than electrodes made of expensive precious metals such as gold or silver. The fibres are manufactured in the following way. Small copper particles are added to a polymer solution. This solution is guided through a small, ring-shaped slit in a water bath, in which the polymer solution solidifies into the form of a thin hollow fibre. A thermal treatment is then employed to remove the polymer and partially fuse the copper particles. The result is a copper oxide fibre. Reacting this with hydrogen at a high temperature yields the final product: a hollow, porous copper fibre with a diameter of 1.5mm and a wall thickness of 0.1mm. Because this manufacturing technique is based on the way polymeric hollow-fibre membranes are currently constructed on a very large scale, e.g. for kidney dialysis equipment, the researchers involved believe it will be relatively easy to produce the new electrode on a commercial scale. The method can be used for a wide variety of chemical processes requiring gas conversion, in particular because the method used to manufacture the fibres is also suited to materials other than copper; it could apply, for instance, to oxygen conversion in a fuel cell, or hydrogen conversion in the electrochemical production of ammonia. The researchers particularly envisage an important area of application for these copper electrodes to be in the steel industry, where large volumes of CO2 are produced and CO is needed to convert iron ore into iron. The application of these fibres could lead to a step increase in sustainability in this area. The operation of the fibre has been demonstrated in the laboratory; working together with the Institute for Sustainable Process Technology the researchers now plan to optimize the design and develop the methods to suit industrial applications. High school chemistry suggests that for every two CO2 molecules converted to two CO molecules, there would be one O2 molecule as byproduct, unless the oxygen were reacting with something else. There are a couple nearby planets whose primary atmospheric component is CO2. A super-efficient process for creating O2 from CO2 might come in very handy on Mars and Venus, assuming it could be separated from the toxic CO to a very high degree. Zubrin pointed out something like this, but this process appears to be unusually efficient. To take it a step further - is there a process to reduce CO to just C and O? If you pump enough energy into it, sure. However, CO is a very stabel molecule. Carbon dioxide is also a very stable molecule (carbon monoxide is even more stable). Generally when you burn something (or more generally: in any exothermic reaction) the products are a lot more stable than the educts. So to get them to spearate you have to pump a lot of energy in.